Gardening is a hobby which provides a feeling of achievement. When we harvest plenty of tomatoes, cucumbers, and other vegetables, it gives us a sense of profusion. Again we get mesmerized to see the massive shade tree which we planted at a young age, and it grows with us into adulthood. Besides getting fascinated by the beauty of the garden, there are lots of benefits of gardening as well. It helps us by improving our overall physical and mental health. One research shows that garden enthusiasts experience less anxiety and depression than other people. Because gardening provides a therapeutic and natural experience to the people to build better mental health. Again some people consider gardening as a good form of exercise. By moving your body constantly while planting, you can keep yourself healthy and fit. But all the useful facts turn into a nightmare when someone fails to build a successful garden. Besides destroying the overall beauty of a garden, it can affect someone’s mental health too. And this type of situation takes places because of having a lack of knowledge as well as using inappropriate devices for gardening. Besides other gardening tools and machines, a smart wheelbarrow is also essential for building a successful garden. So, savvy gardeners always choose the best wheelbarrow to get the job done. 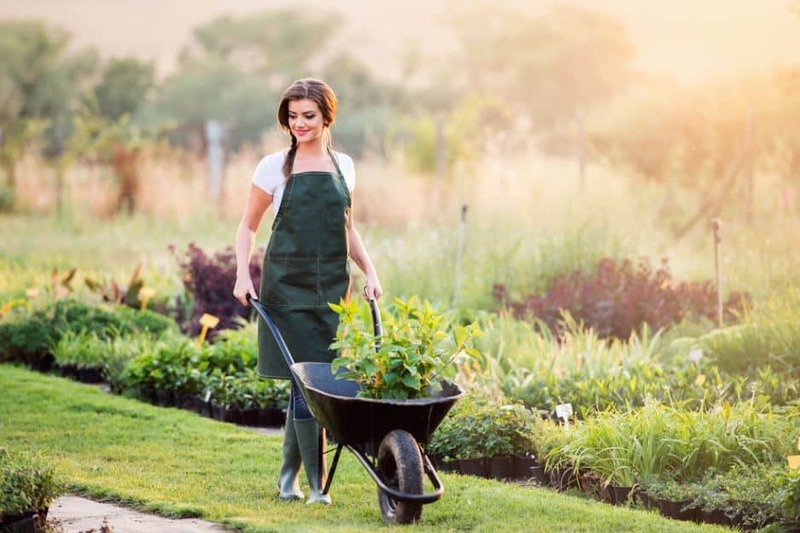 And if you are looking for one ideal wheelbarrow which matches your demands, then we recommend you to take a look at our list of the top ten wheelbarrows for gardening. First, you need to check how durable it is. You can guess the durability by inspecting the materials which have been used to make the wheelbarrow sustainable. Then you should check the wheels along with tires. Besides, you also need to know the load capacity of the wheelbarrow and the additional features as well. However, to make your selection easier, we have reviewed the best wheelbarrow which may fulfill your requirements. So, let’s have a look at the buying guide before moving on to the features of these best wheelbarrows. 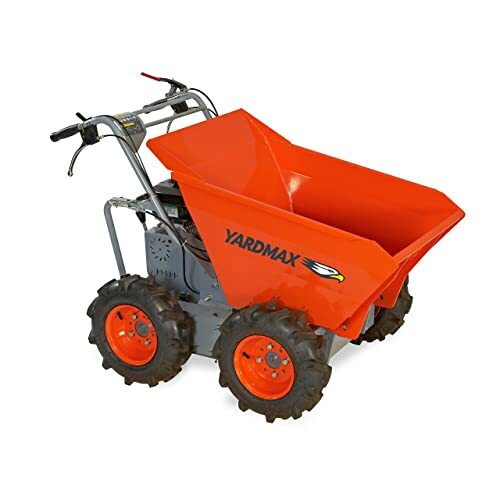 YARDMAX YD4103 Power Wheel Barrow is an excellent workhorse for the farmer or gardener. The machine comes with a 4.4 cubic foot hopper. And it can load up to 660lbs which is an ideal weight to get the job done. The hopper is made of steel and has a tough coating over the steel. So, it is ultimately resistant to corrosion. That means users can dauntlessly load hard materials such as bricks and rubble etc. Also, the hopper can tilt a full 90 degree to release the load. And users need a minimal effort to tip the hopper even though it is fully loaded. Then the wheelbarrow comes with a powerful 208cc engine which is manufactured by Briggs & Stratton. Both EPA and CARB certify this engine. The engine is self-propelled, and users can nimbly pull the machine through any terrain. By drawing on the recoil starter, the Briggs & Stratton engine starts with ease. After that the power transfer through a heavy-duty transmission and engage the speed with three forward as well as one reverse to the wheels. There is a clutch lever placed on the left of the handles to control the engine. Users need to press down on the clutch and hold it down to keep moving. Again users can easily stop the machine just by releasing the clutch. The motorized wheelbarrow features a zero-turn radius which means users can comfortably drive the vehicle with the handle. For that, each handle has an attached brake lever. When the rider pulls on the left brake, the wheels on that side will stop to turn the machine left, and the right brake does the same to set it in the right direction. Besides that, all the wheels come with directional AG tires to provide traction across uneven, muddy, or wet ground. Overall, despite being a heavy machine, the YardMax is agile to operate and user-friendly to the beginners. The WORX Aerocart comes with an excellent design for every garden enthusiast. 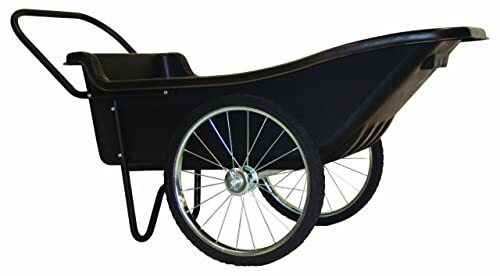 The company provides a wheelbarrow along with a wagon kit. Which means you can convert your Aerocart into a Wagon or Garden Cart in seconds. 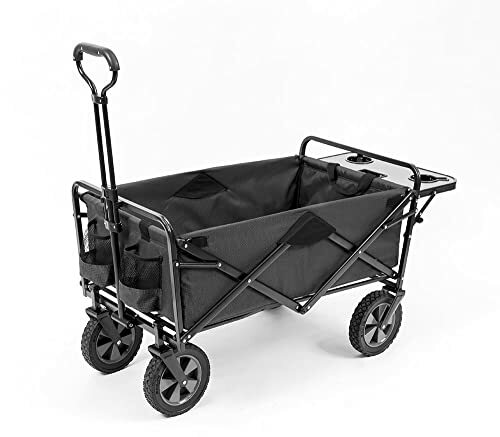 You can connect the wagon kit to the upper part of the Aerocart, where the handles are situated. Besides that, the package includes a seat and a tray, so you can set it for sitting, or you can load it to pull. Again the wheelbarrow is constructed of high-quality steel so you can load even the sharpest brick as well as rubble without worrying about the damage. Also, you can easily lift the barrow with long handles which are thickly padded to ensure comfort. For quick turning, the wheelbarrow features a two-wheel design. For that, you can quickly take a corner with a shed load. Engineers give the barrow a folding design so that you can use it as a cart. It has extendable arms to carry flower pots, small trees, mulch bags, straw bales, etc. The vehicle is lightweight for easy transportation and strong enough to deal with the hard task. The wheelbarrow has a dolly feature too. By flipping down the shelf, you can turn the wheelbarrow into a dolly. You can carry a heavy load with the dolly because it can bear the weight of 300 pounds. Next, the most fantastic feature of the wheelbarrow is the plant and rock mover. There is a harness placed on the extended arms. With the harness, you can quickly move the rock and unwanted plant as well. The wheelbarrow also features a bag carrier, a cylinder carrier, and a trailer tote. You can use the bag and cylinder carrier when the wheelbarrow is in dolly mood. And the trailer can be used in cart mood. You can easily attach the cart with your motorbike or other vehicles with the trailer tote. In a nutshell, Worx Aerocart is offering a lot of features at a reasonable price. So, anyone won’t regret purchasing the excellent wheelbarrow. If you are searching the best motorized wheelbarrow which you can afford at a low price, then we recommend you to have a look at the Power Assist Wheelbarrow. The wheelbarrow is something else because you can load up to 200lbs and can handle it on the rough terrain as well. And it runs on a powerful 24-volt battery which ensures an electronic ride. Besides that, the paw features two-wheel drive system which means you can easily move and turn it around. Again it comes with two 13″ pneumatic tires, and it won’t harm your lawn. It also has forward and the reverse controlling system. Merely pressing the push-button, you can control the barrow. And it also features speed gears to burst the power for the uneven surface. For that, you can move the paw on 15 degrees incline. The machine is highly durable because it is made from rugged steel. 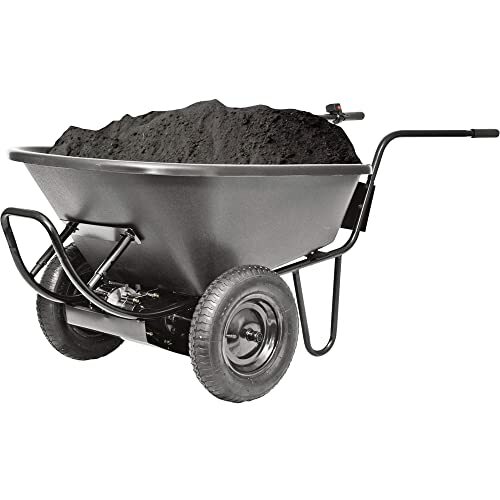 Overall, it is an excellent wheelbarrow for hauling dirt, sod, sand, shrubs, rocks and more. Polar Trailer 8376 is a perfect utility cart for any gardener. It is specifically designed to haul various kinds of things such as firewood, dirt, mulch, rock, etc. Which means that the polar is versatile too. The cart is engineered to provide maximum durability. So, you can comfortably use it. Besides that, the Polar Trailer allows you to convey up to 400 pounds of weight into its ten cubic-feet tub. Again the container is made of polyethylene to prevent corrosion and allows the user to haul almost everything from the yard. The wheelbarrow is highly portable since it is lightweight. And for easy transportation, the barrow features two 20 inches spoked-wheels including solid-rubber tires. As a result, you won’t need to worry anymore about getting a flat. All the features of the Polar trailer make it highly demandable to all garden enthusiasts. So, you may choose the wheelbarrow to beautify your garden or yard. The Marathon Yard is one of the most popular wheelbarrows available in the market. The lightweight and ergonomic design makes it popular and also suitable for working in the garden. If one-wheel wheelbarrow is obsolete for you because you need something A1, then the marathon can be a good one what you are looking for. It offers more comfort and stability than the other wheelbarrows. And it allows you to carry up to 300 pounds of stones, mulch, sand, and other related items. It has a plastic shell of 5 cubic feet for the transport of goods. Although the tray is made of plastic, it is resistant to corrosion and strong enough to handle sharp objects. It also comes with cushion-grip handles so users can effortlessly pull or dump the contents of the yard. Besides that, it has air-filled tires to maneuver comfortably on different terrains. The wheelbarrow weighs only 29 pounds so anyone can steer the barrow. Again, it is effortless to assemble, and you need a wrench and a screwdriver to install the cart. 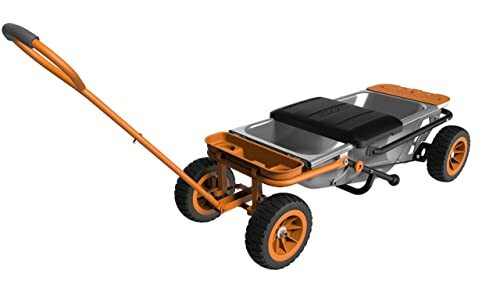 Overall, the Marathon Cart can be an alternative option to a traditional one-wheel wheelbarrow, and you may choose this as an assistant for garden work. Mac sport is well-known for making recreational furniture and equipment. Their craftsmanship is excellent, and they are good at impressing their customers. And you may notice it with their outdoor wagon. The wagon comes with unique and attractive features which are enough for garden or apartment related task. This machine consists of heavy-duty steel and 600 denier fabric to ensure durability. And it will allow you to carry 150 pounds of gears. Which means it provides you with a large interior and the interior measures about 43.7 inches by 20.2 inches and 22.5 inches. So, you can bear plenty of objects with this wagon. You can also use the wagon to take a trip down to the lake with a picnic lunch and some cold drinks. Because the wagon comes with folding table along with an adjustable handle for easy transport. It features a rear folding table with two cup holders. Besides that, you get two additional mesh cup holster to keep your beverages safe and sound. Lastly, another noticeable feature of the mac sport collapsible outdoor wagon is you can folds out it to a compact size of 8 inches. So, it will fit even in the tight space. In a nutshell, mac sports ensures that you get much more facilities at a reasonable price. Jackson M6T22 is specially designed for construction usages. So, it is made of thick steel to ensure maximum durability. And it won’t get broken by carrying a heavy load. The wheelbarrow comes with a six-cubic-foot tray to keep high contents. The tray features curved front braces to dispose of the weight. And the front pairs consist of heavy gauge seamless steel. Besides that, the barrow also has The “H” brace along with cross stripes and leg shoes. To push and pull, it has 60 inches heavy-duty wood handles. Though the handles are made from wood, still they are sturdy enough to get the job done. Again, you usually won’t find the hardwood handles in the conventional wheelbarrows. You also get one 16 inches pneumatic wheel to move the Jackson M6T22. Overall, all the features make it suitable for the heavy loading. And the manufacturer guarantees that you get much sturdier wheelbarrow without spending more bucks. Best Choice has a reputation for making high-quality stuff. So, undoubtedly their wheelbarrow deserves a second look and pretend to be the best wheelbarrow which you may choose for your yard, lawn or constructional works. The wheelbarrow is constructed with a sturdy steel frame so that users can hold up to 265 pounds. And it comes with a thick five cubic foot tray to carry out heavy tasks without any struggle. As a result, anyone can easily transport a large load of soil or other garden materials. Besides that, the barrow features with two 13 inches rubber wheels which allow users to maneuver with ease. And they can steer the wheelbarrow almost on any uneven terrain. Again, it has durable handlebar which is designed with a rubber coat, and it is thick padded. For that, users can comfortably move the cart. If you are searching for a versatile wheelbarrow, then this one is ideal to check. The Polar Trailer 8449 Cart is one of the lightest, yet heavy-duty wheelbarrow available in the market. 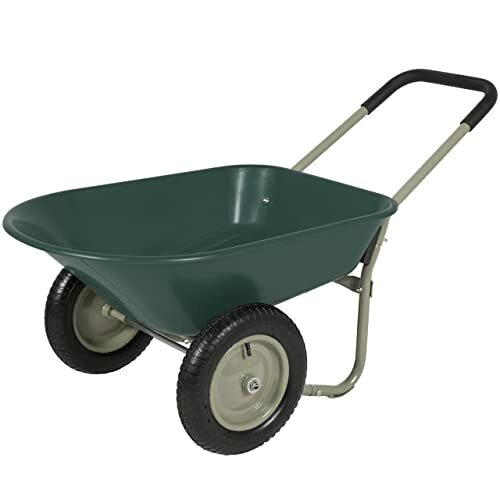 This wheelbarrow is manufactured with high-quality materials such as its stainless steel frame has powder coat finish. And the tub which is made of polyethylene offers seven cubic feet space which means users can carry a large amount of weight. Users can convey approximately 400 pounds! So, it is quintessential for hauling rock, dirt, leaves, grass clippings, gears, and other tools. Engineers give it an ergonomic design, so the cart provides good traction on any surface with its two 16-inch wheels. These wheels have rubber tires which are rugged enough. Besides that, the cart features shielded ball bearings for smooth moving on any terrain. Aside from that, the wheelbarrow needs negligible space for a full turn around. As a result, it will be very convenient in case you ever get narrow space. Overall, Polar Trailer 8449 Cart can be an excellent choice as your garden assistant. This wheelbarrow is specially designed for the kids from three years to around ten years. The manufacturer has taken special care of the wheelbarrow at the time of building. It is made from high-grade plastic material, and the tub is constructed with poly to resist corrosion. The whole cart measures 33-by-17-by-15 inches. Although the wheelbarrow comes with a junior size, it has man-size features. Also, it has wooden handles, and they are sealed. As a result, you don’t need to worry about slivers and contusions. Kids can comfortably maneuver the wheelbarrow. Because it has a solid rubber tire which features steel axle along with ball bearings. And the wheelbarrow is durable enough for hard play. If you are looking a lightweight, safe and attractive wheelbarrow to give as a gift to your child, then you may check The AMES Companies Inc KPWB10 1.25Cf Kids Wheelbarrow. To purchase the best wheelbarrow, you need to research properly. Besides, you should try to avoid getting fooled by the beauty of the wheelbarrow and try to give importance to the relevant factors. Here are some most important things that you need to know before making any decision about purchasing. If you are concerned about the thousands of wheelbarrows which are currently available in the market today, then you need to choose the best one depending on your usage. In other words, the purpose of the purchase is an essential factor to consider while purchasing. For example, if you want to use the wheelbarrow for lifting the heavy load, then you need to make sure that whether the barrow can carry out such weight or not. Also, you need to ensure that the wheelbarrow is not so heavy and does not add any burden to lift the objects. The usage of a wheelbarrow differs from users to users. People use it for garden works, domestic works and also for construction task. It doesn’t matter how you use the wheelbarrow if it offers maximum durability. So, this feature is also essential to remember before buying any wheelbarrow. Otherwise, you may need to spend a lot on repairing the barrow, or you may have to buy a new one every month. Therefore, make sure that your wheelbarrow is durable enough to withstand any condition. The number of wheels is matters, and it depends on how you use your wheelbarrow. So, the number of wheels needs to be your third consideration because it affects the stability of the barrow while moving on an incline as well as on different types of terrain. Therefore, you need to ensure that you choose a wheelbarrow which can complete your task. So, we recommend you to check this feature very carefully. Single-wheeled wheelbarrows are the simplest of all wheelbarrows. They look like an ordinary wheelbarrow, with a wheel at the front. A wheelbarrow with a single wheel does not weigh much, rarely more than 200 pounds. Although these machines come at a reasonable, they are unable to convey heavy load. Besides that, one-wheeled barrow has less stability, and the cart can easily tilt to one side or the other side. Besides that, it also does not have the best inclination. However, if you intend to do light gardening, then this type of wheelbarrow will suit your requirements. Two-wheeled wheelbarrows are a step up from the single-wheeled barrows and offer you with a lot more stability and traction. It comes with the same handle setup for easy maneuvering of the wheelbarrow. Besides providing better traction, it also offers you improved hill climbing abilities. And the wheelbarrow won’t fall over easily because of having these two wheels. So, it will be a better option for multiple usages. Three-wheeled vehicles are the next level of two wheels. The design of a three-wheeled barrow has come with two wheels (front or rear) and a third wheel on the opposite side. You can have two drive wheels and a single rotating wheel to turn the wheelbarrow or a single drive wheel and two swivel wheels to turn. A single drive wheel can be just as good (sometimes better) if the wheel is big enough and has good traction on the ground. Hence, these wheelbarrows are probably the most popular design for horticulture as well as for lightweight construction. The four-wheeled wheelbarrows are the best option regarding stability and control. On four wheels, they look like amazing pickers. Some manufacturers offer that you can use the barrow as a four-wheel drive or two-wheeled. The four-wheel drive gives you the best traction though. They use the same zero-turn action that you may notice in some tractors. The wheels on one side slow and turn at a 0 ° rotation and the inner wheels stops completely to give the machine the lowest turning radius. 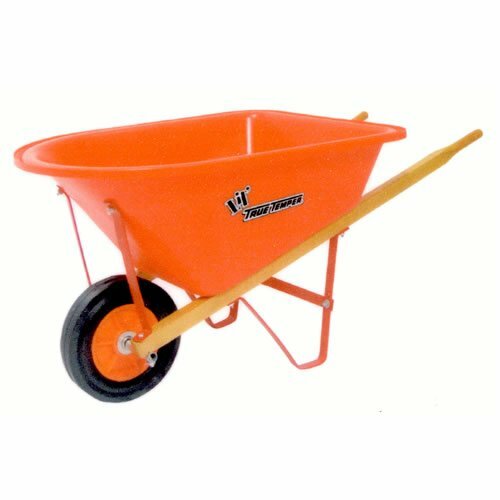 Usually, this type of wheelbarrows features a higher load capacity of 600 LBS and more. Overall, it can be the best option for all gardening works. The use of engines makes the wheelbarrow more potent than other wheelbarrows. In general, they are larger than four-wheel barrows and can handle more significant loads. The main advantage of using the motorized wheelbarrow is the possibility of managing an inclination of up to 45 °. These motorized machines are highly specialized and come with high-strength construction. Although these wheelbarrows are usually expensive because of having powerful gasoline engines, they can make your task easier. Regardless of the number of wheels and the way they are driven, the type and size of the wheels must also be taken into consideration. As we know, large wheels are suitable for more difficult terrain. So, if you have a high budget, then you may move on the motorized wheelbarrows. Another essential fact to consider is the terrain in which you want to use the wheelbarrow. You need to choose wisely the barrow in order to drive it on muddy, rocky or smooth ground. So, before investing in a barrow, you need to determine in which area you will use the wheelbarrow. In general, it is sturdy for a single-wheel cart to work effectively in a rugged environment. However, two- or three-wheeled barrows are designed for easy navigation in rocky environments. 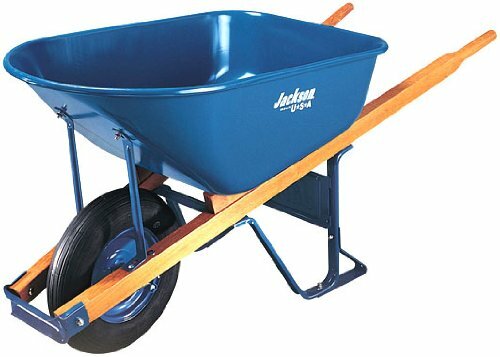 A very relevant factor to contemplate before purchasing a wheelbarrow is the amount of load/weight that it will be carrying. Nobody wants to make a huge mistake by buying a low capacity wheelbarrow. So, you have to look for a high capacity wheelbarrow if you intend to lift a heavy load. 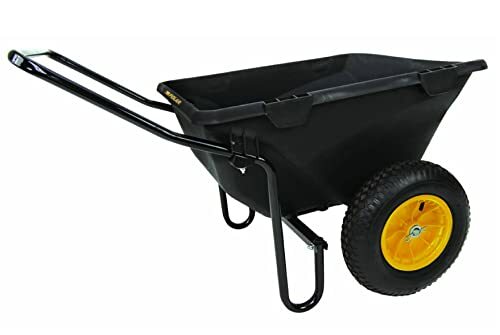 In short, we recommend you to choose low capacity wheelbarrow if you want to do light gardening works otherwise you need a high capacity wheelbarrow. Another essential feature to consider before buying a cart is its weight. 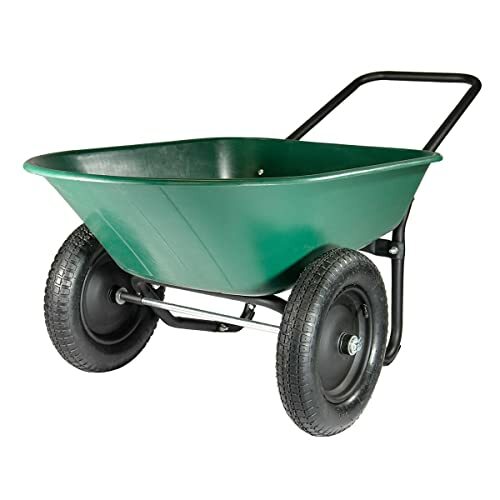 Generally, a lightweight wheelbarrow provides less stability than others. You may also won’t like a wheelbarrow which is too heavy. Because if the wheelbarrow is too heavy, you may have difficulty to move it. Especially if you are moving heavy objects in a rocky environment. In this case, we suggest you to prefer a light wheelbarrow to transport heavy objects because that makes life a little less tiring. For what you use a wheelbarrow, the hopper is probably the most important factor for its ease of use. Many of these machines have a removable hopper which generally offers greater versatility. The volume of the hopper is measured in cubic feet. Small and medium-sized motorized carts have a hopper between 3 and 4 ½ cubic feet. And most containers are made of sturdy plastic which will not rust and can withstand the rigors of the garden. Again some have a steel hopper which is very durable. For gardening (moving plants and wood), a steel container may be preferable. If you use a standard wheelbarrow, you will tilt it regularly to empty the hopper. And the operating mode of dumping depends on the wheelbarrow’s design. Generally, single or two-wheel wheelbarrows operate like a conventional cart, which means that you lift the handles and tilt the vehicle by turning the front wheel. Besides that, the weight of the machine as well as the contents of the hopper is considerably increased. So, you need pretty strength to empty the hopper. The handle provides leverage that allows you to tilt the weight. For that, the length of the handles is also significant. Although longer handles make lifting more natural, it increases the height. Therefore, it will be difficult for an average person to empty the hopper with long handles. In this case, you may choose a well-designed container because it has a perfect center of gravity, which allows most people to tilt it with one hand. Again large machines which can carry a lot of weight use electric or hydraulic motors to drive the tilt mechanism. So, you may also go for an electric hopper. Some wheelbarrows come with extra accessories. Like you may get a plow or scraper to clear an area. Again you may get optional load beds which can be ideal for carrying larger objects. And you also can have a tow hitch which allows you to attach a trailer to the wheelbarrow. So, you should check that the wheelbarrow you want to buy whether comes with extra features or not. Many buyers make the mistake of ignoring the emptying process of the wheelbarrow at the time of purchase. Each barrow has different techniques and methods of emptying. Some are very easy to empty, while others are a bit difficult and sometimes require the help of a third party to unload. So, before you buy the wheelbarrow, you need to remember that it should be easy to empty. The wheelbarrows are designed to be durable. Therefore, you need to ensure that the barrow features maximum durability. For that, you want to be sure that the manufacturer will easily replace/repair the stuff if there occurs any defect after the purchase. Usually, the manufacturer gives a guarantee to explain the quality of their stuff. Which means, their stuff is made of high-quality materials and can resist damages. So, we suggest you to always rely on guaranteed products. A good wheelbarrow matters a lot to a gardener or landscaper. If you don’t have the best wheelbarrow, then it will be daunting to manage gardening works. Even you may not be able to transport your rakes, brooms, hoes and other equipment properly at once. So, you need to be very careful before making the best purchase. For that, you need to do research widely about the stuff you want. As various brands are producing different wheelbarrows. So, you need to check and compare wheelbarrow’s features like durability, stability, maneuverability and other things. And the essential fact is the price, and you need to try to get the best at your budget. We hope that our review can help you with sufficient quality information and it can also influence your decision to purchase the right wheelbarrow.